Compared to other hip-hop releases this year so far, Terradactyl is effectively peerless. As singular as it remains, Radiohead's Kid A has nonetheless become useful shorthand for a major stylistic transition within an artist's career. From time to time, a new release will be received as so-and-so's Kid A, and the comparison usually concerns the daring and eccentricity of the album in question rather than its specific sonic properties. Within hip-hop, this assessment happens infrequently, but it is interestingly on point with regard to both the shift and the sound. Erykah Badu earned the comparison with tracks like "Twinkle" and "My People" on last year's New Amerykah Part One (4th World War). 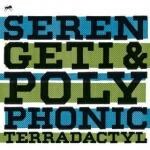 Serengeti, aka David Cohn, no stranger to nontraditional hip-hop records, now dives into this territory with Polyphonic, aka Will Freyman (together again after 2007's solid Don't Give Up), and the Radiohead comparison has rarely been more pertinent. Terradactyl doesn't take that band's experimental turn as much as it appears to evolve from the same place. Warp's Artificial Intelligence releases, Fat Cat's 1-8 Split Series and similar albums before and in between formed the rough blueprint for Kid A. Those same influences are part of the DNA of Terradactyl, and Polyphonic expertly grafts IDM roots into Serengeti's truly progressive mission. Compared to other hip-hop releases this year so far, Terradactyl is effectively peerless. The album's journey is best experienced as a whole, and it plays out much like one multipart song. Even though the tracks are traditionally separated, songs bleed into one another more often than not. Certain motifs appear multiple times but never in a heavy-handed fashion. The care with which Polyphonic pulls this off is matched by Serengeti's lyrical trip, which hews closer to epyllia than pleasure-seeking mainstream hip-hop. Terradactyl fixates on transience, insecurity, and responsibility. Serengeti's lyrics refer so specifically to places and people that the listener might assume these are personal experiences being aired. Yet their poetic function is never lost, and the specificity raises as many questions as it answers. The result is a perspective that far exceeds the personal. Serengeti uses this distinctively envisioned atmosphere to address cultural, political and spiritual tensions. The depth of the lyrics rivals Aesop Rock, Claudio Sanchez or Adam Drucker, but Serengeti sidesteps alternate universes in favor of social realism. The trip begins, aptly, with "Bon Voyage", a reluctant mission to "provide a warm place for you can get high ... that beautiful place for you to grieve". The stream of consciousness provides glimpses into a volatile relationship and the psychological and physical detritus that prompts a forward movement. Though however strong the desire for escape, it is not always so easy to move on -- a realization embraced with an unexpected degree of romance by "Playing in Subway Stations". Like a folked-up Vitalic, the song is both urgent and static, layering a drowsy acoustic guitar over Polyphonic's plucky eighth notes. The sonic contrasts are echoed by a restlessness within the lyrics. Renee-Louise Carafice joins Serengeti for a duet about the fading charms of transience: "Wasn't that fun for us? / At first it was but now it's getting old." Yet even as the youthful ideals crumble, the singers concede, "It's not so terrible when I'm with you." One outstanding feature of the album is its struggling solipsism. Serengeti (or whichever persona he wears) is concerned above all else with the connection between identity, lost opportunities and disappearing communities. In "Move!" he claims, "There's an I and there's a me / Ain't no we" but then seems instantly unsure of even his own existence. The existential section concludes with "My Negativity", which mixes an upfront cello with video-game sounds and the album's first nods to conventional hip-hop. The song is not a traditional banger, but the Eastern-influenced rhythm and vocal cadence (especially the playful "My nega-nega-nega") seem less alien than a lot of the preceding material. This touch of familiarity is well placed within the song sequence because formlessness soon returns with "Cleveland", which occupies the "Treefingers" position of the album. If the first half of Terradactyl is a retreat from social ills, then the second half might be considered an aggressive, if not fully triumphant, re-entry. Serengeti comes back to the girls, to the clubs and to the cars in order to subvert them all. "Call the Law" is both an ode to self-determination and a bold takedown of rap's low culture and its crippling influence. Serengeti juxtaposes the pride and hubris of superstar rappers with the poverty of inner-city life, testing it all against the various things we refer to as "the law". Throughout, he questions the value system that would "Celebrate we hood / Everything's all good…Sell them some new drinks / Sell them some new pants / Put rap in schools / Celebrate jail stance." He repeatedly knocks the hustle but also doesn't condescend to the listener, as if he has all of the answers. In three and a half minutes, "Call the Law" is as rousing and provoking as both Spike Lee's Bamboozled and Juan Williams' Enough. The cultural critique continues with "My Patriotism", which Polyphonic keeps lively and fresh with an accordion and a mandolin. The disconcertingly pleasant music conveys the empty high society Serengeti attacks, as well as the distracting contradictions of success: If all that matters in his country is the accumulation and maintenance of wealth, then that is no more rewarding a lifestyle than the poverty he explores elsewhere. How could he be a patriot if he cannot find anything that inspires pride? Again without a place in the world, Serengeti returns to his gleaner's paradise for "Dawn Under the Bridge", another striking duet with Renee-Louise Carafice that suggests off-the-grid living might have some spark left in it after all. The epilogue, "Calliope", collects all of the album's musical themes and lyrical concerns. Serengeti ponders the different directions his life might have taken, and there's no comforting falling action for the artists or the listener. Lean but emotionally loaded, the song ends at a tense moment, with Serengeti noting, "It has to stop, it has to stop." Like almost everything else on Terradactyl, the choice to conclude in this manner is risky yet rewarding. It leaves the listener at the precipice, fulfilled and eagerly awaiting the next album.